by Una M. Cadegan. Cornell University Books (Ithaca, N.Y., 2013). 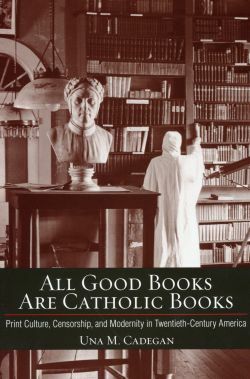 Una M. Cadegan in her short but dense history, “All Good Books Are Catholic Books,” describes an intellectual war between Catholicism and modernity that reached its high-water mark in the first half of the 20th century. While it may have been a bloodless war, it had consequences as profound as any war fought on a battlefield. The church’s principal weapon was censorship of theological works and works of fiction and nonfiction. With the closing down of immigration to the United States in 1920, Catholics shifted from being powerless newcomers in an alien branch of Christianity to being assimilated Americans with a real voice in print culture. There was an explosion of new publishing houses, books, journals and magazines all run by Catholics for a Catholic audience. Catholics also became influential in the burgeoning film industry of Hollywood. Catholicism’s enemy, modernity, was less of a movement than a collection of ideas that sprung from the rapid expansion of scientific knowledge, from the development of psychological theories, from the dissemination of the evolutionary ideas of Darwin, and the important changes in scriptural study, namely the historical critical method. All of these ideas were gaining importance as the United States was transforming from a rural, farming nation to an industrial giant. Modernism exalted the individual, encouraged experimentation in the arts, cast suspicion on institutions, questioned the supernatural and pushed religion to the sidelines of culture. But most threatening to the Catholic Church was the lessening of its influence and control of its adherents. The church’s response was to censor all books and silence all authors who posed a threat to its teachings. While the Index of Forbidden Books had existed for many centuries, the promulgation of the Code of Canon Law in 1917 reinforced its authority. As a consequence, Catholic seminarians were taught the same Neo-Scholasticism of St. Thomas Aquinas while Protestants took the lead in theology and biblical scholarship. The center of theological study shifted from Italy to Germany. But the conflict for American writers was especially difficult as they were forced to navigate between remaining faithful to the church’s teachings and the freedom of expression guaranteed by the First Amendment. Adding to the pressure was the conviction of most American Catholics that censorship was good and useful in the fight against socialism. Cadegan shows how American Catholic writers managed to reinvent realism, which had been scorned by most modernist writers, by emphasizing the incarnate goodness of the world, a world made bleak by the ravages of the First World War, while not ignoring the evil humanity creates. By the 1950s, the idea of a Catholic writer being outside the mainstream of American intellectual life diminished, while the Index of Forbidden Books — like the Legion of Decency for films — lost its power and disappeared in the upheaval of the 1960s. The Second Vatican Council embraced the theology that the church had banned for decades; modernism had triumphed. American Catholic writers and theologians had reached an equal place with other American writers and intellectuals. But the mystery, even the glamour of the Catholic Church as a world apart, unchanging and eternal, had also been lost. It is a loss that can never be recovered and, for some Catholics, that is a tragedy. Yearley is a graduate of the Ecumenical Institute of St. Mary’s Seminary and University in Baltimore.